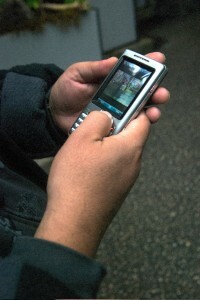 Voting just began for UC Berkeley’s Human Rights Center Mobile Challenge. There’s an impressive gallery of projects and we are excited to have our proposal for Handheld Human Rights among them. There are approximately 50 projects in the gallery, and the 10 projects that receive the most votes between now and Friday, March 27 will be invited to the Soul of the New Machine: A conference on technology, new media and human rights at Berkeley in early May. After the projects are presented, a panel of judges will award prizes to the top three entries. Our project, Handheld Human Rights: Using mobiles to help human rights organizations make data more accessible and actionable. Guardian: A Secure, Private, Anonymous Telephone built on Google Android. From the Director of Digital Operations for Students for a Free Tibet’s 2008 Beijing Olympics campaign. Freedom Fone: From colleagues at Kubatana in Zimbabwe comes a project that marries mobile phones with citizen radio programming. FrontlineSMS + Cell Alert = FrontlineSMS Alerts - an integrated tool for sharing information. Mobile Video Training tools on Human Rights from Witness. Don’t forget to vote for your favorite projects by Friday, March 27 at 6 pm EDT. Celebrate If you’re in NYC, join us at the Sunburnt Cow this Wednesday, March 25, for an evening of engaging conversation, good drinks and an opportunity to vote for projects in the Human Rights Center Mobile Challenge. If you’re in the city, we hope to see you there!